As suggested in yesterday’s market commentary for the usd to cad the pair duly obliged with a mildly bullish tone during the trading session which has followed through in this morning’s early trading with a further small rise in the US Dollar. The candle from yesterday on the daily chart ended the session with a deep lower wick which found support from the 9 day moving average which is always an encouraging bullish sign, and with the 9 day now crossing firmly above the 40 day moving average this is adding weight to the picture. In addition this morning’s price appears to be clearing the resistance in the 1.16 price region and should we see a move above and hold at the 1.175 region then we may even see a re-test of resistance of the 1.2 area, in due course. 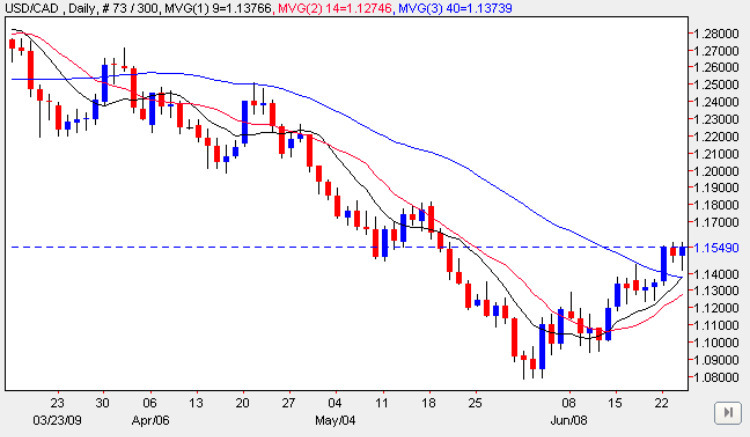 With all three moving averages turning higher this has become more of a sustained rally rather than a short squeeze, and with the possibility of some sustained dollar strength returning to the market this move may have some “legs”. With only the unemployment claims due out in the US there is no fundamental news on the economic calendar for Canada. My trading suggestion for this pair is to look for some inter day small long positions using the 15 minute chart to time your entry and exit points and using tight stops. However, do bear in mind that momentum may be low as all markets appear to be pausing.